Computing is seen as an essential area of learning. It plays an important role in the everyday lives of children, young people and adults. Consequently, schools need to build in the use of new technologies in order to equip young people with the skills they will need to access life-long learning and employment. At Eversley Primary School, we are delighted to provide children with the opportunity to use a wide range of resources to deliver our curriculum. Whilst exciting and beneficial both in and out of the context of education, much IT, particularly web-based resources, are not consistently policed and users need to be aware of the range of risks associated with the use of these Internet technologies. At Eversley Primary School, we understand the responsibility and importance of ensuring that the children are aware of and understand a range of eSafety issues. 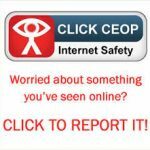 CEOP will help and give advice, and you can make a report directly to them if something has happened online which has made you feel unsafe, scared or worried. This might be from someone you know in real life, or someone you have only ever met online. CEOP takes all reports seriously and will do everything they can to keep you safe.